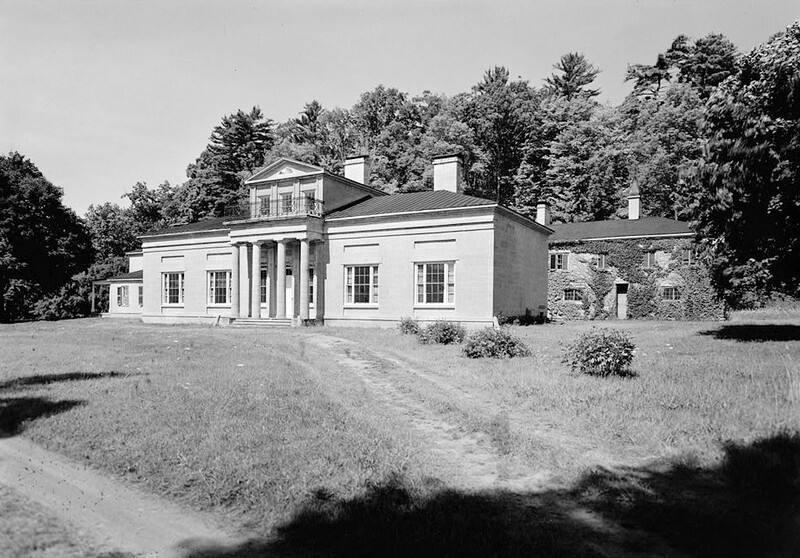 The main part of the house was completed in 1815 in the Colonial style by by George Clarke, a great grandson of the Colonial governor of New York. It is two stories high and 200 feet long. Later the present facade was added in the Empire style - 100 feet in length with two rooms on either side of a large entrance hall (1832). It was noted in the Freemans Journal on June 4, 1891 that "that part of Hyde Hall which was left unfinished by George Clarke the elder, who constructed it at periods from 1816 to 1832, has just been finished by his grandson G. Hyde Clarke, the present occupant." This two-story stone house has a portico with an attic and balcony and interesting interior woodwork and cove ceilings in dining-room and drawing-room. Walls are made of stone, which was quarried and cut in nearby quarries. It has six chimneys. It sits overlooking Otsego Lake, surrounded by old trees and forest land. Approached by three private roads. With a Gatehouse guarding the entrance to one of these roads. (Region known as Hyde Bay) on 3,000 acres. House faces southeast.